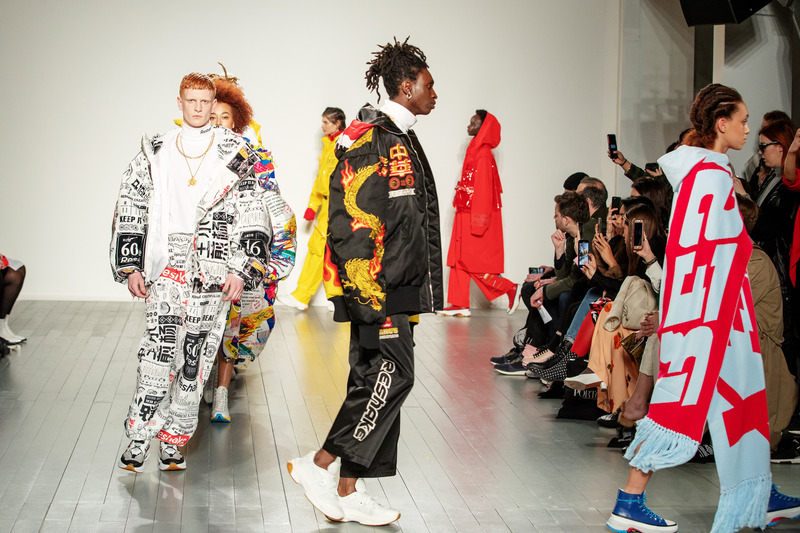 Reshake, a Chinese streetwear brand based in Shanghai, showed their designs as part of the On|Off catwalk show during the London Fashion Week at the BFC Show Space on Feb. 19, 2019. Under the theme of "Keep it Real," the new collection combines experimental contours with various materials like coated fabrics, PVC and heavyweight knitted fabrics, as well as large pieces of traditional Chinese embroidery, catering to the high-quality fashion and lifestyle attitude of young people passionate about street culture. Jonny Fu, Reshake's design director, has worked with many lux brands and was also the costume designer for the Chinese movie "Tiny Times." During the show, many fashion industry celebrities were spotted seated in the front row, including Rafferty Law, Fengli Xu, Chloe, Miny and Nabai Pan. On|Off is a talent support program and catwalk experience that showcases the work of emerging designers amid the official London Fashion Week schedule. Reshake showed their designs as part of the On|Off catwalk show during the London Fashion Week at the BFC Show Space on Feb. 19, 2019.